My Dad used to make these as a special treat every so often when we were kids and they rarely lasted overnight. They are delicious… And very simple to make. 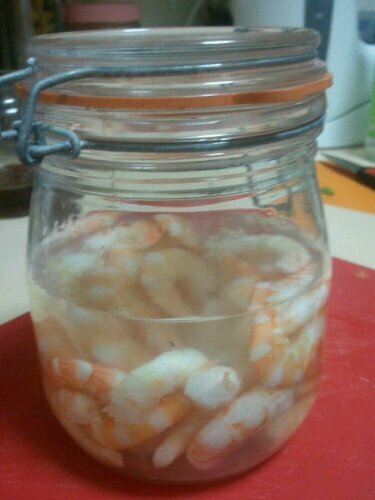 Add peeled prawns to a jar with equal amounts water and vinegar (enough to cover the prawns). Only add salt if the prawns are not already salty enough. Pop a lid on the jar and place in the fridge overnight. You should leave them in the jar to pickle for at least a day before eating them. I usually just eat a few straight out of the jar, but they are delicious in sandwiches.